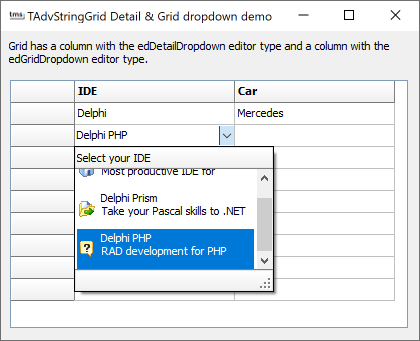 These two built-in dropdown editors can be accessed via grid.DetailPickerDropDown and grid.GridDropDown. A dropdown control can have a header and footer as well. The header and footer can contain additional informational text or can have buttons for specific actions. The dropdown footer and header can be customized with grid.ControlLook.DropDownHeader and grid.ControlLook.DropDownFooter. 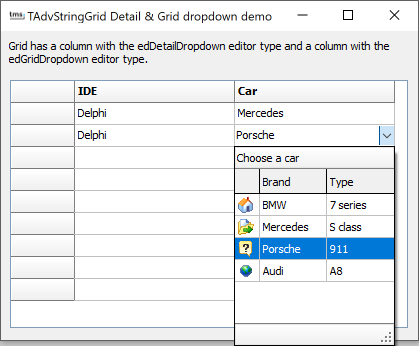 To have different dropdown header and/or dropdown footer for different inplace editors or for different cells, the header and footer of the dropdown control can also be set from the event OnGetEditorProp. ImageIndex: integer: sets an optional image for the item when value is >= 0.